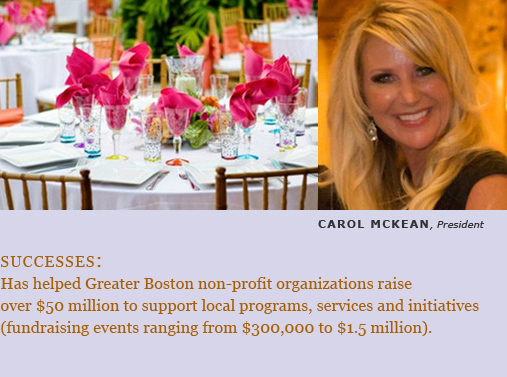 At Carol McKean Events we pride ourselves with our success and proficiency in retaining dollars, activating community participation and building public awareness to ensure all aspects of your fundraising and event goals are met. Working with local and national charities, organizations and individuals, it is the mission of Carol McKean Events to assist in making a difference, to improve the communities in which we live and work. their quest for a brighter tomorrow. For further information: info@carolmckeanevents.com • Site Design: Gilbert Design Associates, Inc.